The Raucous Royals gives a glimpse into the lives of 13 royal rulers. But there is far more gossip and rumors to uncover surrounding each of these intriguing characters. To dig deeper, click on the nav to the left to find book recommendations on specific royals. When it comes to breaking biographies down to the most fascinating tidbits, Kathleen Krull is the queen. Although this book is not just about royalty, there are several royal characters covered including Cleopatra, Eleanor of Aquitaine, Isabella I, Elizabeth I, Catherine the Great, Marie Antoinette and Victoria. Throughout the main biographies Krull weaves in juicy bits of trivia and gossip showing both the cruel and kind side to every ruler, but always ending in a respectful, nonjudgmental tone. Both adults and kids will enjoy learning about Elizabeth I's temper during card games or Eleanor of Aquitaine's mock courts of love or the lavish courts of Cleopatra's reign. The Lives series are the perfect books for the reluctant history lover. Although less playful than Krull's interpretation of Royal Queens, Meltzer's well-researched portrayal of some powerful women in history is the perfect book for readers looking for a book that sticks to the facts and covers just the right amount of detail to keep the reader interested. Dinner with Vlad was no picnic. 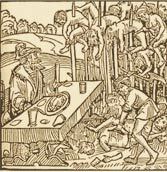 Read the true story of Dracula and how he got the name, Vlad the Impaler. The Order of the Dragon was the knightly order who made it their mission to defend the cross and drive out the Turks. The order was represented by a winged dragon with a curled tail that sometimes held a cross. Vlad's father, (Vlad II) was a member of this order and used the above symbol on his coinage. Look for the Order of the Dragon symbol hidden on page 7 of the Raucous Royals. To find more art clues, check out the art dectives section.